CCN wishes to thank its readers and subscribers for helping it reach its 200th edition today. From its humble beginnings in November 2004, CCN has succeeded in amassing a strong and loyal readership locally, nationally and internationally over the past four years. During the course of this period CCN has received a number of emails of commendations, comments and constructive criticism and we thank you for all of them. We have tried to serve our constituents in a number of ways, not least of which by acting as a window into our community through which a large and growing readership of non-Muslims and ethnic communities is able to gain a better understanding and appreciation of a community living, working and playing right alongside them. It is also a glowing commentary on the quality and standard of the journalism of CCN (and a vindication of its motto to be self-deprecating) that the exploits of Mula Nasruddin and our ubiquitous Man-on-the-Mussallaah appear to dominate a major share of our reader's attention. CCN's readership is also equally divided between following Kareema's keep fit classes and indulging in KB's exotic food recipes, and yet others have found refuge and solace from (the mediocrity of) CCN by branching off to the CCN Book Club for unadulterated intellectual stimulation. It has been a challenge and an honour and a privilege to be able to chronicle the activities of our community and hopefully, in some small measure, touch the hearts and minds of our readers. With your support and interest we look forward to continuing in this vein well into the future as we head forward to our next milestone, insha-Allah. Thank you, dear CCN Reader. 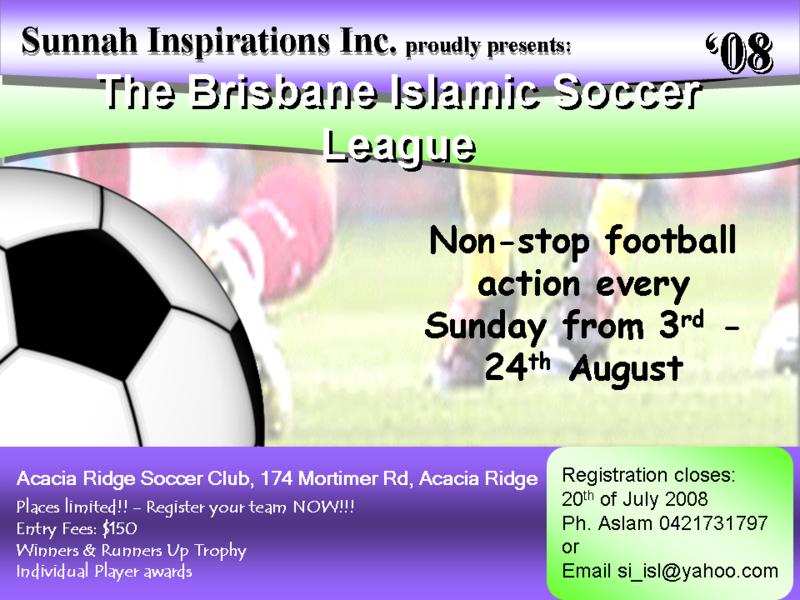 MYServices will, insha'Allah be launching its youth leadership development program this November. We request your input into the program, as Muslim youth, community leaders, educators or interested citizens. Thank you to all the wonderful CCN readers who responded to last week’s call! Your responses were amazing and reassure us that Muslim youth leadership development is not only much needed, but wanted. We now only have 45 responses to go, to reach our target. We would be extremely grateful if you can please spare 5 short minutes now and complete this anonymous survey. The survey will be taken off on Saturday 13th September. Tell us how you think a youth leadership development program should look like! We are very grateful for your time. Thank you so much. 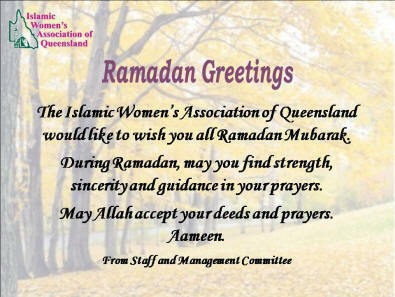 It gives me great pleasure to send greetings of peace and well wishes to my Muslim friends during this holy month of Ramadhan, a time of spiritual reflection, devotion, community, generosity and mercy. I wish you all the best for the rest of your fast. Ramadhan Mubarak. Human Appeal Int. Melbourne wishes the Muslim community a prosperous and bountiful Ramadan. As Ramadan is a time of giving, we encourage the Muslim community to participate in our Ramadan projects. We would like to this opportunity to wish our many Muslim friends and neighbours within our local community a blessed and spiritually-beneficial Holy month of Ramadan. Understanding and acceptance of each beliefs and cultural backgrounds, are vital ingredients in keeping strength and stability within the wider community. Without the positive contribution of our Muslim neighbours and friends, this strength and diversity would be greatly weakened. You are invited to a presentation by political activist Michael Shaik on Friday 19 September at 9pm at the Kuraby State Special School. Michael will talk on recent developments on the human rights ships that recently journeyed from Cyprus into Gaza in defiance of the Israeli blockade. 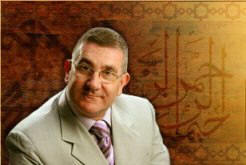 He will also talk on the Israel Palestine conflict and answer questions on the subject. This is a free event and tea, coffee and deserts will be provided. There is also an ifthar dinner being held between 6pm and 7.10pm with Michael Shaik at the Curry in Kuraby Restaurant prior to this presentation. 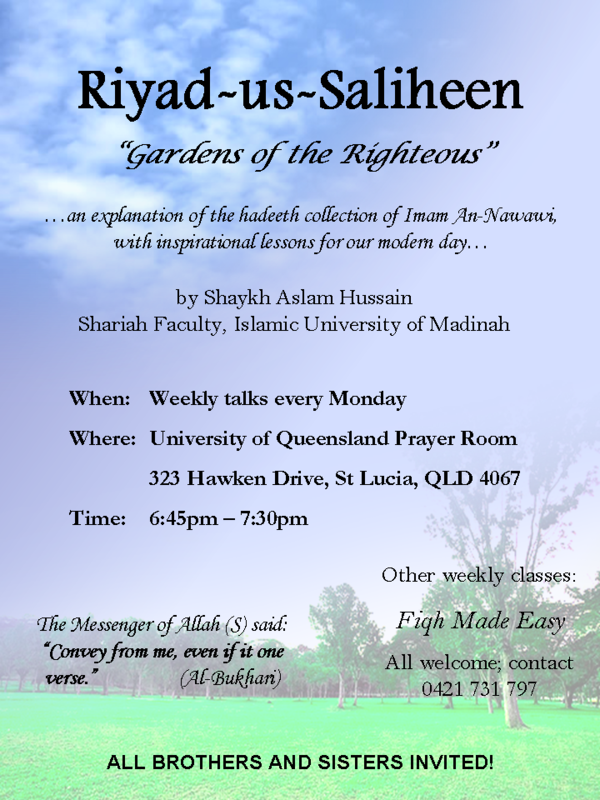 If you are interested in coming along please call 0402 026 786 or email ccn@crescentsofbrisbane.org. The cost of the dinner is $20 and places will be allocated on a first-come-first-served basis. The Department of Justice and Attorney-General in collaboration with ECCQ has funding available to train six (6) community leaders to become Justice of Peace (JPs). ECCQ recognizes that to train people from CALD backgrounds will empower communities to better manage their affairs. JPs play a very important role in the community. They are volunteer workers in Queensland’s legal system and perform a wide range of services, from witnessing the signing of documents to hearing certain matters in court. • registered on the State electoral roll. To be a Qualified JP, you need to sit and pass an exam, which requires a moderate to high level of English language skills. If you know of community leaders who might be interested in taking part in this great initiative, please contact Sharon Malebogo Orapeleng on 3844 9166 before Wednesday 10 September. A group of locals got together and staged a mini-tennis tournament at the Eight Mile Plains tennis courts last Sunday. 40 players participated in this tournament and ranged in talent from verging on the professional to bounding with enthusiasm. Recently the Dutch public broadcaster IKON (Netherlands Interdenominational Broadcasting Company) and Radio Netherlands Worldwide launched a world first: the Bible and Koran brought together on a single Internet site in Dutch, English and Arabic. See www.bibleandkoran.net. By making accessible the texts of the Christian and Islamic holy books, BibleandKoran.net "hopes to encourage study of both sources and promote mutual understanding." 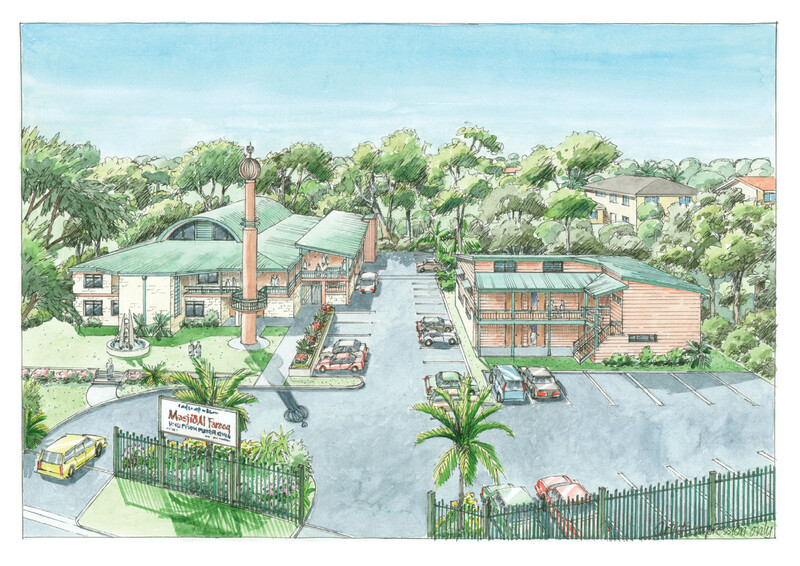 Rowdy opposition to a proposed new Muslim school in Sydney’s south-west has again exposed a deep-seated fear of Islam and what this faith stands for in the modern world. 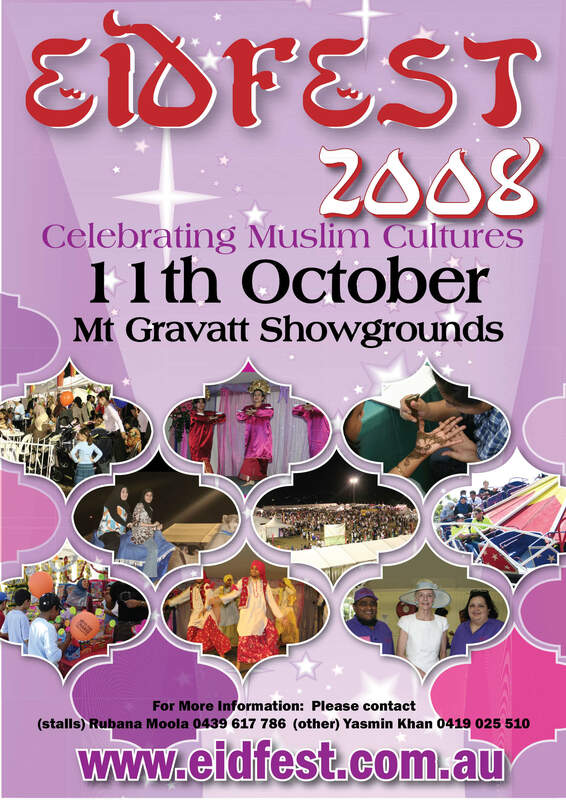 Around Australia there are about 30 Muslim schools and more are planned. What goes on in an Islamic school? Who are the students and teachers? How do their curricula differ from other private and state schools? How much focus is there on religious instruction? Compass explores the stories of two Muslim schools to find out. Seven years on, the destruction of New York's Twin Towers, played and replayed thousands of times over, is seared into collective memory. A third skyscraper also fell that day. Unlike the Twin Towers, the 47-storey building known as Tower Seven was not hit by a fuel-laden plane, yet it collapsed neatly in 6.5 seconds. The official explanation is that it was destroyed by fire. But in the seven years it has taken to present the final investigation report, suspicion has filled the information vacuum. Tower Seven has fed an industry of conspiracy theories that grew up around 9/11. Claims are pressed – by a phenomenally popular movie on the Internet and by supposedly credible "experts" – that someone in or close to the US Government brought the building down by controlled demolition. How, among the many questions they ask, could Tower Seven be the first and only steel-framed skyscraper in the world to collapse due to fire? Why did the New York fire department not fight the fires? Why did it fall so symmetrically at freefall speed? Why did TV stations report that Tower Seven had collapsed before it had done so, when it was still clearly visibly behind reporters? This BBC documentary explores some of these questions. In doing so it demonstrates how, when good information is scarce, or late, many people will believe the worst. "9/11: The Third Tower" – on Four Corners 8.30 pm Monday 8 September and 11.35 pm Tuesday 9 September (also 8am Tuesday on ABC2). The Kuraby Mosque will be conducting an information and exhibition session at the Mosque on Sunday 14th from 1pm to 2pm to present the plans to extend the existing Mosque and Madrasah. The community is invited to attend the presentation at 1pm and to offer up any suggestions on the proposed plans. You can view an artist's impression of the preliminary plans here and the drawings here. 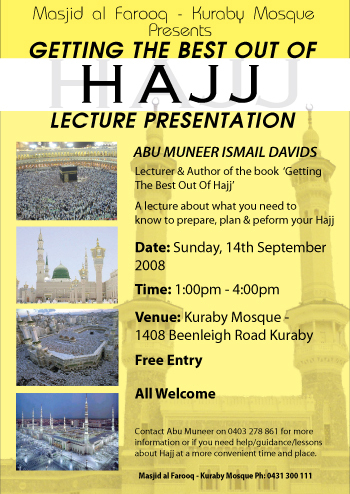 Feedback in the form of written submissions can be made to contact@kurabymosque.org.au or on the day of the presentation. On behalf of the following families, we would like to invite you and your family to join us for iftaar on Saturday 20 September at the Algester Islamic Centre. Please accept this as a personal invitation and your presence will be highly appreciated. 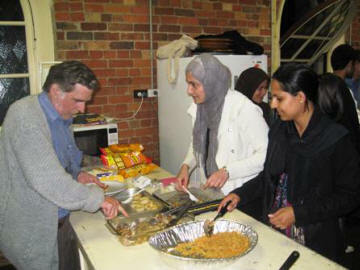 The spirit of Ramadan was felt on Friday night at St Andrew’s Anglican Church, West End. 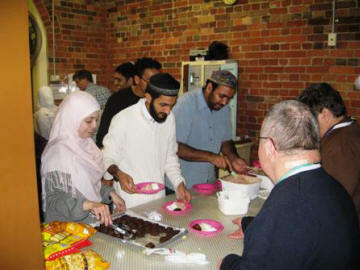 AMARAH members and friends cooked, hosted and served a meal for the some of the less fortunate members of our society. The over 60 people who attended were homeless, mentally ill, and/or living in desperate situations, financially and physically. It was an enjoyable night for all- those who came hungry and sad left with a full belly and smiles. Conversations were exchanged and new connections were formed. 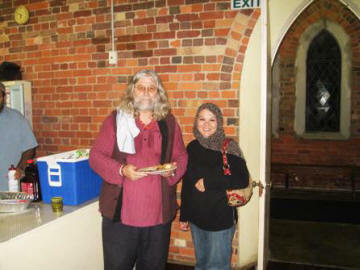 Many of the homeless joked that they were also fasting and were eager to “break their fast” with us. For the AMARAH team, it was a humbling experience, and those who participated were thankful for the opportunity to make a little bit of difference to some people’s lives. This simple act of feeding our hungry friends truly exemplified the compassionate spirit of this blessed month. AMARAH would like to thank the generous donors, the cooks, the serving and cleaning team for making this night happen. And a big thanks to Dave Andrews* and his friends at St Andrew’s Anglican Church for allowing us the space and opportunity to host this dinner. 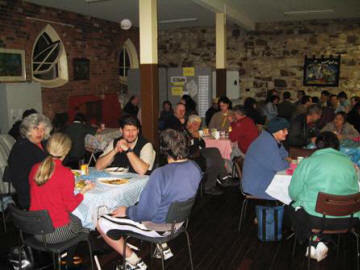 Our next meal for the homeless and disadvantaged will be on Friday 19th September, St Andrew’s Church. *Dave Andrews is a close friend of AMARAH and is a devout Christian. This year, he has decided to show his solidarity and fast alongside his Muslim friends. And I am told he’s enjoying the experience. During the Holy month of Ramadaan we are reminded of the plight and suffering of those less fortunate than ourselves. Not only is Ramadaan the perfect time for such reflection, but due to the auspiciousness of this month, it is also the perfect time for giving. Eid Clothing - An amount of $15, to provide new clothing for one needy child. WASHINGTON (AFP) - As Islam makes inroads in the United States, American Muslims are setting up mega-mosques that combine religious tradition with typical American convenience. UAE. English football club Manchester City have been taken over by the Abu Dhabi United Group for Development and Investment, a statement released to PA Sport on behalf of group representative Dr Sulaiman Al-Fahim said on Monday. The deal has been agreed between Al-Fahim and City's owner Thaksin Shinawatra, with Dr Khalid Kadfour Al-Muhairy, the head of the Emirates Group for advocate and legal consultants, also involved in the negotiations. 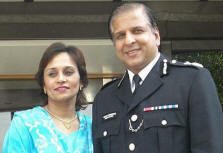 UK: Race row police chief Tarique Ghaffur could face an acrimonious divorce battle, it was revealed during the week. The Scotland Yard assistant commissioner has told his wife of 20 years that he wants to end their marriage with a "no fault" divorce. But she has told friends that she will not accept the split and will fight any such move. The Assistant Commissioner, who is embroiled in one of the largest racial discrimination cases to be brought against the Met, could now face a second legal battle. It is believed Mr Ghaffur has formally asked his wife Shehla, 42, a primary school teacher, to agree to a no fault divorce on the grounds that the marriage has " irretrievably broken down" as the couple have been living apart for two years. Mrs Ghaffur, his second wife with whom he has two teenage children, is said to have been notified of the request this week. She lives in Manchester with their children, where Mr Ghaffur began his policing career and rose through the ranks before moving to London as Britain's most senior Muslim officer. But his marriage has run into trouble after he developed a friendship with Rubina Haider, a 44-yearold mother-of-two. He has become increasingly close to the divorcée since beginning the friendship about a year ago. The pair have been seen in public with Mr Ghaffur taking Ms Haider to official engagements and posing for photographs with her at an Asian awards ceremony. Ms Haider is a department store sales assistant who lives in southwest London. A friend of Mrs Ghaffur said: "Shehla doesn't want to divorce him for the sake of the kids. "She has been loyal to him and supported him throughout his career. She hopes he will come back to her and the children." The friend added: "Tarique is trying to get her to divorce quietly. He can't risk the bad publicity, especially at a time like this. He's already been divorced once." Mr Ghaffur is in contact with his wife and children, making regular visits to the family home in Manchester. It is understood Mr Ghaffur had expressed a desire to return to Manchester after he retired. There is no suggestion Mr Ghaffur's divorce is linked to the case he has brought against Sir Ian Blair. Mr Ghaffur has filed a multi-million pound claim against his employers on the grounds he has been treated less favourably than other officers as he is Muslim and Asian. He also alleges Scotland Yard refused to extend his contract beyond a year as he is over 50. A novel with Islamic themes that was canceled by Random House last month has been picked up by a German publisher, the author said in an interview with a German newspaper, according to The Associated Press. The novel, “The Jewel of Medina” by Sherry Jones, will be published in October in English, Ms. Jones told the newspaper Leipziger Volkszeitung. Random House, a spokeswoman said, “requested that it be postponed indefinitely” after being advised that the book could cause tensions. Idris Tawfiq, a British Catholic priest who became a convert to Islam, is a source of fascination in his adopted home in Cairo. Mary Fitzgerald spoke to him about his personal journey of discovery. A De La Salle brother for 15 years, Idris later studied for the priesthood in Rome. Doubts about his vocation eventually led him to leave the priesthood, triggering a period of uncertainty about what direction his life would take. He decided to take some time off, booking a charter flight to Hurghada, a package holiday resort that hugs Egypt's Red Sea coast. Soon bored of the beach, he headed to Cairo and experienced a culture shock quite different to what he had expected. For the first time in his life he met and talked to Muslims, observing their rituals up close. Hearing the call to prayer and watching people stop everything to turn towards Mecca left a deep impression. "That week's holiday more than anything else changed my life," he explains. "It began to sow the seeds of Islam within me. It was the first time I had spoken to, or even met, Muslims. I saw that they weren't sabre-rattling fanatics, they were just ordinary people. More than that, they were very gentle people and faith-filled in a way I had never seen before." Idris returned to Britain where he taught religion in a secondary school. The events and aftermath of September 11th encouraged him to find out more about Islam. A chance meeting with Yusuf Islam, formerly Cat Stevens, at London's Central Mosque, proved pivotal. A woman swathed in black to her ankles, wearing a headscarf or a full chador, walks down a European or North American street, surrounded by other women in halter tops, miniskirts and short shorts. She passes under immense billboards on which other women swoon in sexual ecstasy, cavort in lingerie or simply stretch out languorously, almost fully naked. Could this image be any more iconic of the discomfort the West has with the social mores of Islam, and vice versa? My husband and I are after an Islamic Will kit. Who can we contact and approximately how much does it cost? WE HAVE MOVED.... Our new office is located at Underwood and we are keen to service our local community and professionally meet their Accounting, Taxation and Financial Planning needs. Apart from our core business services we have an association with a Professional Bookkeeper in-house to help you get your 2008 accounts ready for the Accountant. During this month, we are offering discounts on incorporation services; Company Setup $990, Family Trusts $495 and Self Managed Superannuation Funds $495 includes GST, ABN and TFN registration. Further, our Individual Tax Returns starts from $79 + GST and we will offer 10% discount to all CCN readers for their personal tax returns, Company & Trusts. We wish you all success in this world and the hereafter!! Jalalludin and his friend Mula Nasruddin arrive at the camel station. Jalalludin books a second class ticket on the camel safari heading to his hometown Anatolia. Jalalludin looks at the back seat on his assigned camel and then the front first class seat. Seeing that the first class seat appears to be much larger and more comfortable, he hops onto the empty front seat. One of the camel drivers checks his ticket and tells Jalalludin that his is the seat at the back. Jalalludin replies, "I'm the leader of my tribe and I'm going to sit here all the way to Anatonia." Flustered, the camel driver goes to the head cameleer and informs him of problem with the passenger. The head cameleer goes to the comfortably seated Jalalludin and tells him that his assigned seat is the one at the back of the camel. The head cameleer doesn't want to cause a commotion, and so returns to the tent to discuss the problem passenger with Mula Nasruddin. Mula Nasruddin says Jalalludin is his good friend and that he can take care of the problem. Mula Nasruddin then goes to the camel and briefly whispers something into Jalalludin’s ear. Jalalludin immediately gets up, says, "Thank you so much," hugs Mula Nasruddin, and hops into the back seat of the camel. The camel driver and the head cameleer who were watching with rapt attention, together ask Mula Nasruddin what he had said to Jalalludin. Mula Nasruddin replies, "I just told him that the front section of the camel wasn’t going to Antonia." This week taleem for ladies will be held on Thursday 11 September at the home of Shahena Dhoodia 20 Delaney Court, Carindale from 11am-12pm.